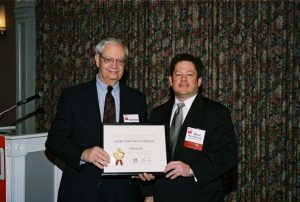 Orlando, FL – 2003 – Sherman G. Miller, President of Multicom, Inc. recently accepted the Export Achievement Certificate at the Global Business Networking Forum, in Orlando. Global Business Advisory Board (GBAB) member, Bruce Blakeman, Deputy Assistant Secretary of the U.S. Department of Commerce presented the Export Achievement Certificate to GBAB member, Mr. Miller. The Global Business Advisory Board was established to provide education to the small and mid-sized companies and to promote programs, resources and initiatives that support international development and trade.